Knowing something bad will happen if she misses, nine-year-old Mara keeps her appointments. And she’s never told a soul. But despite the fear and shame that ensnare her, she clings to the hope that she can break free. Mara doesn’t know her real name. She doesn’t even know who her parents are. But with the help of her best friend, Camilla, and the mysterious Radio Man, Denim, she determines to unveil the secrets that shroud her life. Caught in a maelstrom of lies and deceit, Mara picks her way through the wreckage of a lost childhood until the day something magical happens underneath the pecan tree. 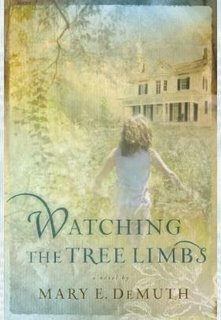 Written in beautiful prose and set against the backdrop of the quirky town of Burl, Texas, Watching the Tree Limbs takes us on a journey through a young girl’s self-discovery and reveals the lengths to which God will go to redeem His precious children. This is an extremely well-written novel. One endorser likened it to Peace Like a River and I think that’s a good comparison. Mara’s character is wonderful. The author captures all the feelings, quirks, actions and decisions of a young girl. Mara comes across as so believable, I expect her to walk off the page. I’m right there with her as she unravels all the secrets in her life, as she uncovers the clues like her favorite character Nancy Drew. The mood and culture of Mara’s small town seemed to surround me when I read. The dialect, the mannerisms, the nuances of society are rich and detailed without intruding on the story. The characters are all very three-dimensional and unique. You won’t find anyone cliché in these pages. It was intriguing to turn the page and be introduced to another original character, someone who adds another color to the story’s complex painting. The spiritual thread is emotional and full of hope. It swells like a wave toward the climax and ending. The love of God in Mara’s life is magnificent. I personally had a hard time reading about the abuse Mara went through. It wasn’t graphic, but it was very powerful for me emotionally, and difficult to read. However, I think other abuse victims will find healing in Mara’s journey because it’s so raw, so real. I’ve been using the word “emotional” a lot because that’s what this book is. The writing is so fine, so beautiful, I can see and hear and feel each character keenly. This is a powerful women’s fiction novel. Get this one! I’m also looking forward to reading the sequel, Wishing on Dandelions. Thank you for your kind words, Camy. I agree with all you said, Camy! I just finished the sequel and it, too, was done so authentically and beautiful.